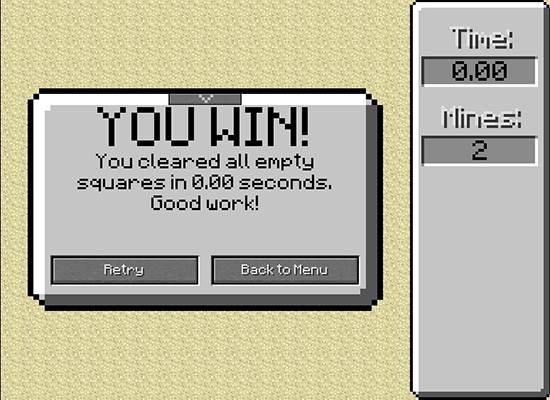 Players’ aim in Minecraft Minesweeper is to clear the mine without hitting any mines. 5 levels in Minecraft Minesweeper game are ready to challenge your abilities consisting of Extreme which is the most difficult level, Hard, Medium, Easy and Beginner. The time you complete a level will be recorded. While the Standard section tells you about levels, the Bonus section tells you how many achievements to get a certain item. You should have q quick look at Upgrades and Extras. Many players love Minecraft Minesweeper and they contribute their ideas in order to help the author upgrade the game. The author thanks for players’ kind support and hope to receive more ideas. Now, have fun time with Minecraft Minesweeper! Minecraft Minesweeper is played with the mouse. If you use FlashPlayer 11.2 or the one which is more advanced, you click right to flag blocks. If not, you both hold control and click to flag blocks. C,V,X, and Z are used to swap two tasks including clearing mines and take advantage of chosen upgrades. Z represents a standard click, X is X-ray, C is Compass, and V is Smart Flag. Players can turn back to Menu under Help, Options, or Extras.